(Bloomberg) -- BTIG analyst Richard Greenfield said in a new note that he’s "tired of watching Snapchat decline from the sidelines" and that it’s now time to sell the stock. His price target is $5, which would represent a roughly 50 percent decline from Tuesday’s close of $9.89. Shares of Snap fell as much as 8.7 percent to $9.03, an intraday record low, at 9:37 a.m. in New York. 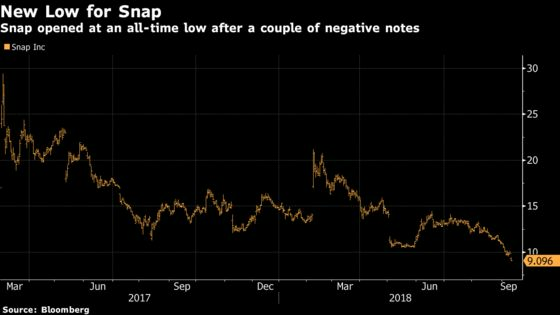 Since shares of Snap peaked in March 2017, the month it went public, shares have fallen more than 60 percent as the company has been beset by weak user growth, challenges to the business model, intense competition from Facebook, and executive turnover. The latest setback came this week with the departure of Chief Strategy Officer Imran Khan. With the downgrade and sell rating, Greenfield also lowered his revenue estimate for 2018, 2019, and 2020. 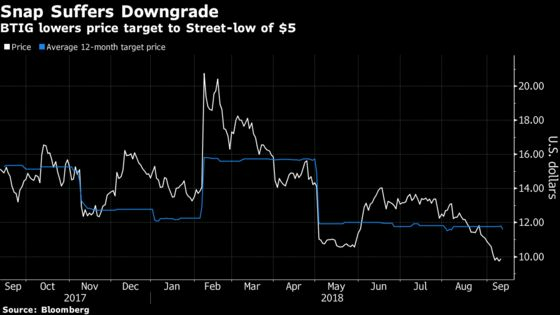 His new price target of $5 is the lowest on the Street versus an average of $11.59, according to Bloomberg data. Separately, Citi analyst Mark May reiterated Snap at a sell and reduced his price target to $8 from $10. He now sees less likelihood of a near-term takeover due to recent operational challenges after previously assuming 50 percent odds of a takeout.